When I have a fish that is not a favorite (porkfish or porgies or most catfish) I generally put them in a a curry. They just serve as the protein backbone of such a meal. You are trying to make a centerpiece out of something most people say is not. Admirable for sure, but making life harder than it needs to be. Now I have never done it myself, but I know someone who canned big Pelagic fish by cooking them up in a big pressure pot and the hot fish pieces are then sealed in sterilized jars. Various herbs and spices are added to the cooking mix. So canning is the process, but it does not involve metal cans as such. The fish thus prepared can be stored for a long time and still be nutritious to eat which means a very big fish can be accommodated for delayed consumption. The All American Canner is a great product as perfectly machined edges create the pressure seal and therefore it has no rubber sealing ring for the lid, you just screw down the clamps in an alternating fashion on opposing sides. Pressure is used to heat beyond the bug killing temperature so you have no risk of botulism. I always thought Dogtooth was a Delicious fish. Poke cut into cubes, brown some minced garlic and ginger, chop up some green onion, mix in some furikaki, some soy, sesame oil, and a mashed avocado. Mix and let chill in fridge until cold. One other way we used to make this which I thought was good was in a banana leaf with Garlic, Ginger, Chili, a little brown sugar, and shredded coconut. Another way was Panko. Cut in thinnish slices, wash in Egg White, dip in Panko with Furikaki mixed in, or in Panko with browned coconut flakes, and fry in coconut oil. Given the option I would always shoot the smaller one. 30lbs is good eating fish and easier to land and also to carry. Maybe the Veal of Doggies tastes better. I would be sure of it, in islander communities they prefer the smaller and younger specimens of most species as they taste better. Anything big is not always well regarded, the term being an “oven fish”. My view is you have to think what you will do with it if you shoot it and at times settled for something more realistic for storage capacity and eating. As my Dad sometimes said, "don't bother shooting another one of those". Since this is a relatively difficult piece of fish to come across there are almost no Google results when you search dogtooth tuna recipes. Most of my dogtooth has been cooked traditionally here in the south pacific, or made into ceviche. Traditional is throwing whatever pieces of fish into a pot with water, coconut cream, and onions. I could take that or leave it. Ceviche wasn't the best I've had, but it worked out. Raw the fish is delicate and has decent flavor and texture without aging, but again, not the best raw fish I've eaten. Let's give people a few reasons to shoot them on this thread! and why not Caribbean blaff ? Blaff is a way a preparing fish that is popular in the Caribbean, especially on the island of Martinique. Fish is marinated in lime juice, garlic and hot peppers and is then poached in the marinade. Some say the name comes from the sound the fish makes as you plop it in the simmering broth. Others say it comes from a mispronunciation of the word "broth" itself. Add the fish, 2 cups of the water and the remaining ingredients to a large non-reactive bowl. 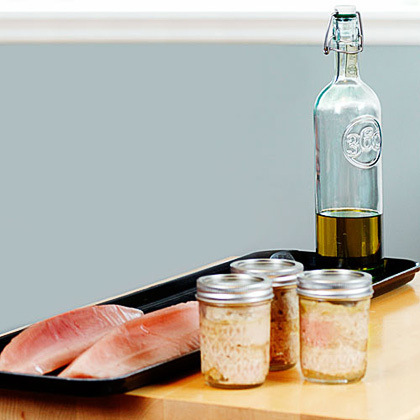 Cover and let the fish marinate in the refrigerator for at least an hour, preferably overnight. Remove the fish from the marinade and set aside. Add the marinade and the remaining 2 cups of water to a large pot and bring to a boil over medium-high heat. Reduce heat to medium low and simmer for about 5 minutes. Add the fish to the simmering broth and simmer for another 10 minutes, or until the fish is cooked through and flakes easily. Adjust seasoning to taste and serve in bowls with lime wedges. Goes well over rice and with boiled plantains as a side dish. Add chopped fresh parsley, fresh or dried thyme and allspice berries to the marinade if you like. Substitute vinegar or lemon juice for the lime juice. Cubed pork is sometimes substituted for the fish. Simmer the pork until it is tender, 30 minutes or so. Dogtooth is actually a Mackeral. It's a white flesh. I bet it would make a real nice Candy. Put a few pounds into a bag with 2 cups Brown Sugar, a little salt, some Ketchup, and chilli or other spices. Let sit over night. Remove fish from bag and let sit on a Smoker Rack in a cool windy place for an hour. Heat up smoker to 200. Put fish into smoker for 3 hours. I know that you can make candy out of kelp, never thought of a fish candy! Hopefully the OP will be happy with these additions as now there are a few things to do with the doggies. Last edited by popgun pete; 03-04-2019 at 12:50 AM. Sharks know a fast food recipe made with fish dt tuna!! I have eaten several Doggies. One thing you need to be careful of is Cig. Most of the island people will not eat the bigger ones over 10 kilos. The meat is white as mentioned before and mild. Lightly cook (Steam, Fried, Baked, Broiled, Blackened) to medium rare with seasons to your liking is my go to for most fish. Use the Forrest Gump Cookbook for shrimp and substitute fresh Doggie meat.